Bicycle Quality/Level of Service (Bike Q/LOS) – a way to measure how safe and comfortable a roadway is for bicycling. Bike Q/LOS uses a letter grading system with “A” being the best (think: my three-year-old nephew could do this) and “F” being the worst (think: Lance Armstrong would struggle). Bike Q/LOS looks at things like whether there’s a bike lane available, the speed of traffic and many things in between. Most importantly, bike Q/LOS helps decision-makers understand what the road is like for bicyclists and when used correctly, can help encourage changes that improve the bicycling experience. Bike lane – this one is pretty self-explanatory—it’s a road lane designed for bicyclists only. 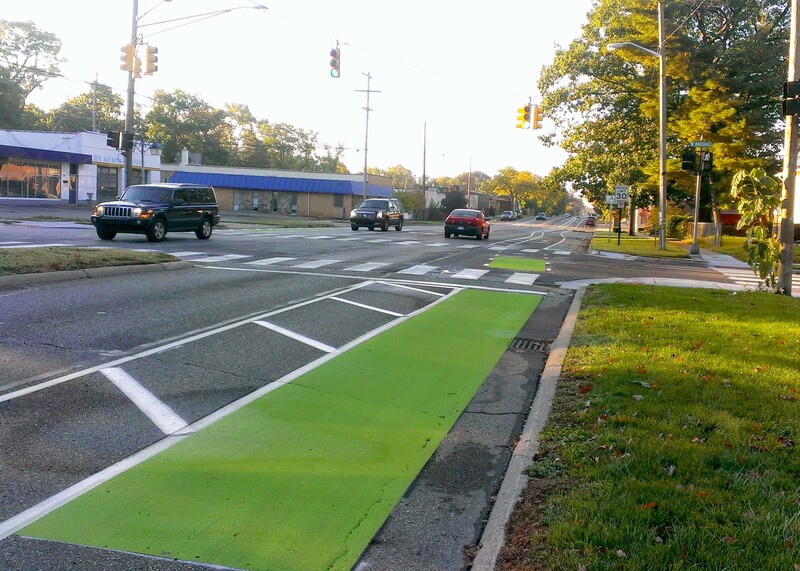 Sometimes a bike lane is called out with a plain white line and a sign, while other times there are more distinct, colorful markers (like this green one in Ferndale) or even physical barriers creating “protected bike lanes”. Bike route – often called out with signage, a bike route can help bicyclists find the most bike-friendly way to a destination by following roadside pathways and streets with the best Bike LOS’s as possible. 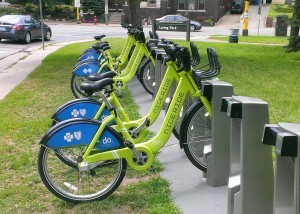 Bike share – a service that allows people to temporarily use a bike. Although bike shares can be free, most bike sharing systems charge by the hour or day and often have frequent-user passes available. Effective bike share systems have bikes available in many locations around a community, allowing a person to pick up a bike in one neighborhood, ride it somewhere and return it to another bike share station. Bike sharing is becoming more and more popular in cities across the U.S. such as Chicago, Minneapolis (shown below) and Washington D.C. and here in Michigan in Ann Arbor and East Lansing. 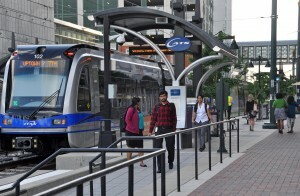 Bus rapid transit (BRT): a high-capacity public transit service that combines the best of a regular bus service and a light rail line. 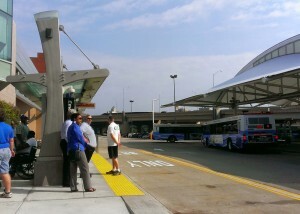 It’s relatively inexpensive and provides fast, efficient service to riders. 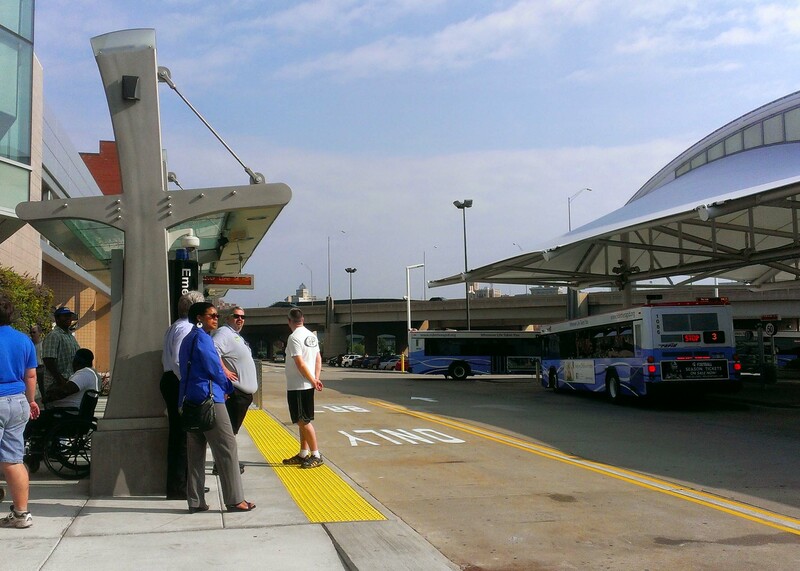 Successful BRT services include things like bus-only lanes, bus-level boarding stations and tickets purchased before getting on the bus. 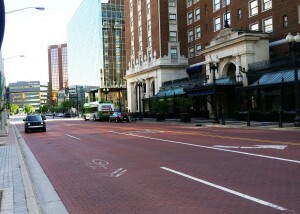 Below is a station along Michigan’s first and only existing BRT line—the Silverline—in Grand Rapids. Ciclovía – this Spanish term means "bikeway" and thanks to a weekly event that began over 40 years ago in Bogota, Columbia, Ciclovía has been coined to the open streets movement. Ciclovía is the temporary closing of city streets to automobiles for the enjoyment of cyclists and other users. Complete Street – streets that work for everyone, whether you’re in a car, wheelchair, walking or biking. Commuter rail - a passenger rail service that connects workers to jobs. Commuter trains usually run during rush hour on routes roughly 30-50 miles each way (although commuter rail routes can be up to 100 miles long). There are two commuter rail projects in development in Michigan: one connecting Howell and Ann Arbor and one between Detroit and Ann Arbor. Curb extensions / bulb-outs – An area of the sidewalk or curb that sticks out into the street to make a crosswalk shorter and create a visual cue for drivers to slow down. Gentrification - a process that happens when property values in a neighborhood increase and low-income residents and businesses are forced out. This is the technical term (usually used in a negative way) to describe the effect that “up and coming neighborhoods” have on existing residents. Heavy rail – weighing more than light rail. Just kidding. But kind of. Heavy rail refers to traditional rail networks that carry anything from passenger rail (think: Amtrak), to freight rail, to commuter rail. Long-range plan – a document that outlines a community’s goals (usually somewhere between 10-50 years in the future), particularly as they relate to things like transportation, utilities and parks. A long-range plan lays out a process to reach the goals with a rough idea about how to pay for it. Mid-block crossings – a place in the middle of a block (not at an intersection) where a crosswalk exists. These are helpful in places with dreadfully large city blocks (sometimes called superblocks). Mode – a jargon-y term that describes the kind of transportation a person is using (driving, walking and biking are all different modes of travel). Mode-share / mode split – another jargon-y term to mean how often a certain kind of transportation option is used. Planners want to understand a community’s mode-share or mode split to make decisions about which transportation projects are more useful. Mode shift – a third related jargon-y term which means to change transportation options. *All the feels* for our namesake. Neighborhood greenway / bike boulevards – a pathway that gives preference to bikers, walkers and people in wheelchairs to connect parks, schools and other places in a community. These routes are often hodge-podged together by trails, sidewalks and residential streets. Currently trending, these paths are very much a vintage community design element. Pedestrian - a person who is walking (or using a wheelchair) in public. Everyone is a pedestrian! Pedestrian refuge – a raised median within a roadway that provides a safe area for pedestrians to cross in two stages. These are especially useful in areas with wide, multi-lane streets and large blocks. They can be located at crosswalks in the middle of a block and the good ones have signals to alert drivers. Planned community – a place that is designed from the ground up--in one fell swoop--in an area that is otherwise undeveloped. For the most part, communities grow organically, over many years, but every so often, someone wants to take control of the whole process. Here are some cool photos of planned communities from space. Planned shrinkage - the deliberate downsizing of a community, usually by removing city services, and almost always as a response to funding shortfalls and/or population loss. Public-private partnership (PPP or P3) – a service or business venture funded and operated through a partnership between the government and a private-sector company. When done right, PPPs combine the best of both the public and private sector (expertise, funding, power) to collaborate on a project that benefits both the public good and the bottom line. Right-of-way - there are a few definitions here, but the one we will most likely be referring to is the use of land for certain transportation purposes. This can be for a car lane, bus lane, bike lane, rail line, sidewalk or even waterway. On that note, did you know that Michigan has an extensive route of water trails? Pretty cool, huh? Roadside pathway – (aka sidepath, aka shared use path) a path usually designed for bikers and walkers that runs alongside a road. Sometimes this is part of a neighborhood greenway. Roundabouts – aside from your grumpy neighbor’s arch nemesis, roundabouts are yield-based circular intersections that allow vehicles to continue moving. When designed well, they can be safer than regular intersections for both drivers and walkers (note to self: print article and drop in neighbor’s mailbox... ). Shared roadway – when a bike lane doesn’t exist, this designation allows bicyclists and drivers to share the street and is usually called out by signs or sharrows (see below). 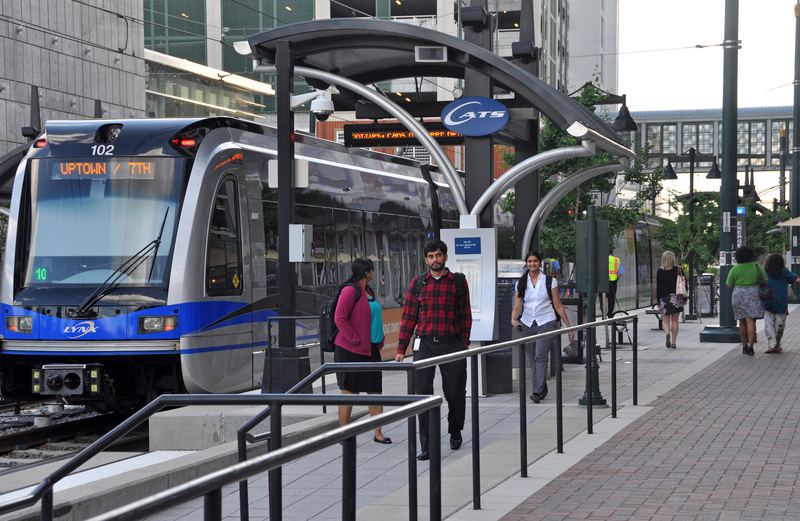 Smart Growth – to plan and develop communities with housing near or easily connected to jobs, schools, shopping and entertainment. 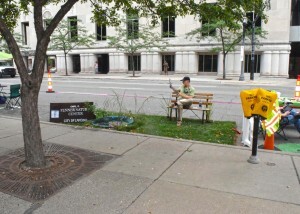 Smart Growth promotes physical activity, supports local economies and protects the environment. Stakeholders - much like stakeholders in a business or financial investment, stakeholders in the planning world are people or groups of people that have a vested interest in the outcome of a project or plan. Sometimes “stakeholders” refers to the general public and sometimes to more particular groups or representatives. Either way, they are invited to be involved--usually by providing input--in the planning and development process. Wayfinding – a term to describe how people figure out their way around a community or building. Planners, architects, and engineers use different elements (such as signage, visual cues, lighting, etc.) in a project or space to help people find their way to their destination easily.